This is an old picture of when my wife and I setup computers. Sorry for the low res. I'm still using these computers today posted on Sep. 11th, 2011. 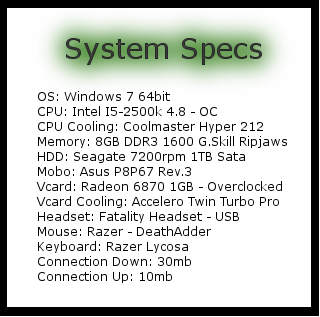 All said and done, BOTH systems came to a total of around 1500 dollars. Both machines are capable of running the latest and the greatest games atm. Nice stuff! I would post a pic of mine but my room is so cluttered right now doing triple/quadruple duty for projects. Once I get Hull Truth moved to another room I'll snap pics again. No flashy case for me in my latest build, I aimed for it to be quiet this time around. 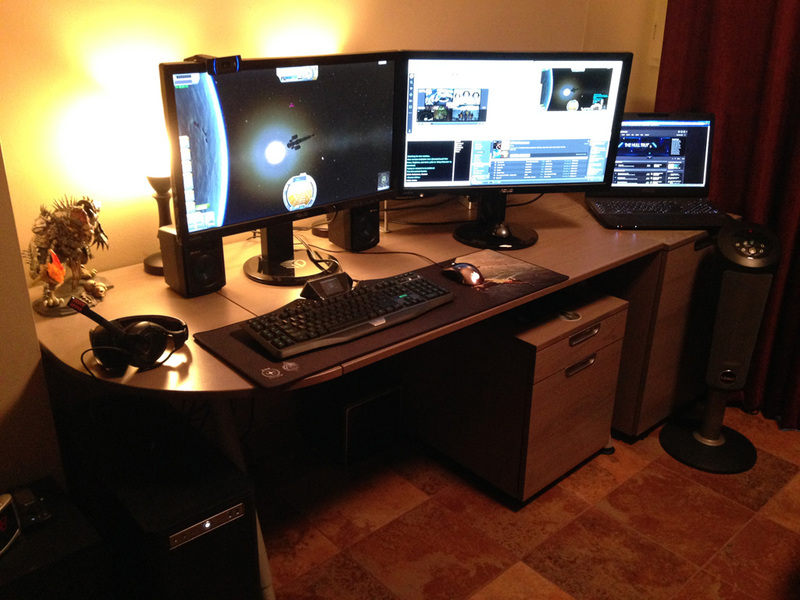 i am liking the look of the lamps behind the monitors, i think i will try it and see how it looks on my set up. Thanks. It was actually done for streaming to try to give a little bit more warm light in the room so I wasn't "blue faced" so badly on cam, but I ended up liking the overall effect it has on the room and use it pretty much all the time now. It's a little washed out in the pic due to the low-light cellphone pic, it's a lot more subtle in-person. Feast your eyes on this amazing setup. It's too strong! It will make you faint! Taken with my cell phone with auto flash. This is where the magic happens people. The mac is next to it, closed, and stacked with stuffs I didn't want in the picture. 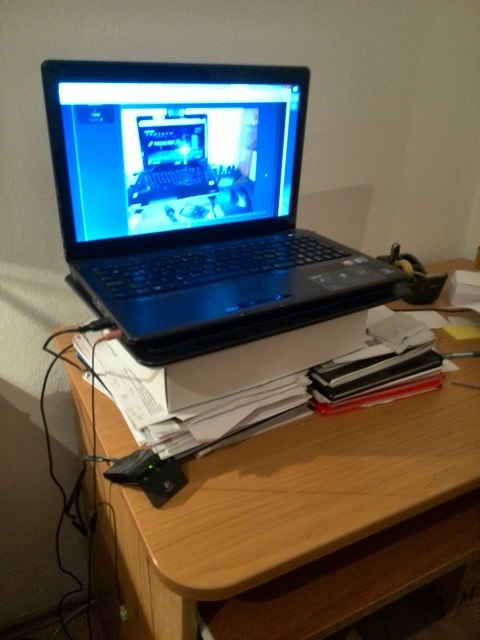 Just too lazy to clear my desk to take a proper one. Edited by Welfeena, 13 January 2014 - 11:06 PM. I hear ya on that one Wes I just built and new PC and I need to rearrange everything! 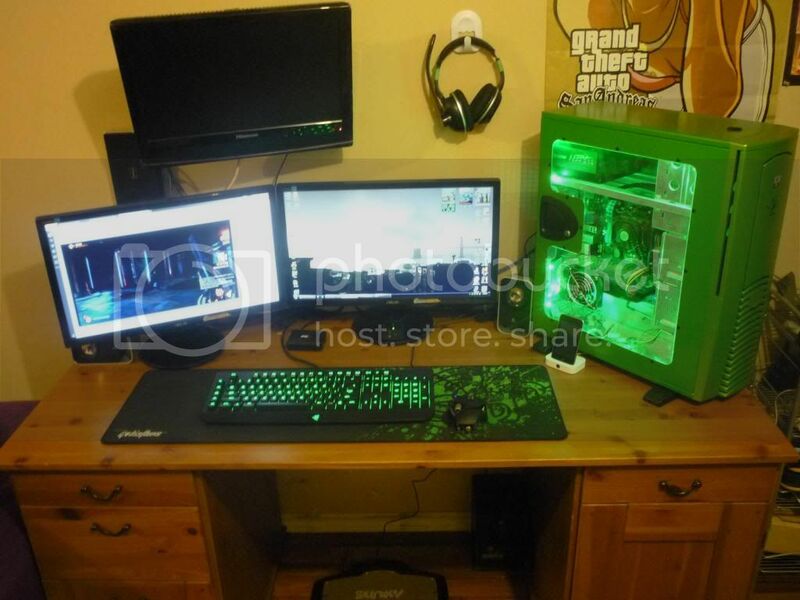 Feast your eyes on this amazing setup. It's too strong! It's will make you faint! Welfeena whatever works for you is awesome in my book. I've had it since 2007 or 2008. It's a trooper that's for sure and still runs like a charm. Mainly because I do maintenance every other day. Now I just want to upgrade but I hate to throw away things that are still working. If it's stupid but it works, it's not stupid. Right? Wait. Is that your PC? Why is it on top of that stack of stuff? ARE YOU AN ALIEN!? Yeah that's strange. It even quoted weird. That is beautiful. What kind of case is that? Dunno why it didn't show, I just attached it and used "show in post" button or something like that. That's like laptop inception. A laptop picture of a laptop picture haha.